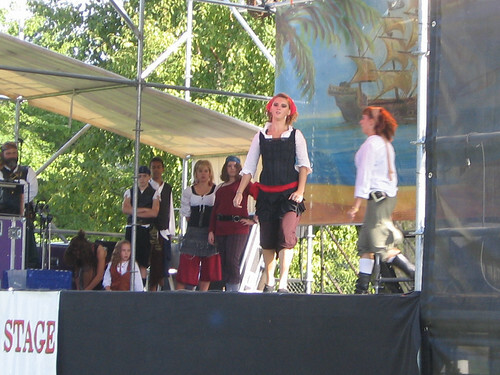 One thing I have discovered in Portland: Portlanders take their pirates seriously. And yet, at the same time, manage to be very tongue-in-cheek about it. I have absolutely no idea how they manage this balance. We started out the morning waking up later than we had, I think, intended. But what the hell, I’m on vacation. We decided that, despite the excellent public transit system Portland is blessed with, we would head out today in JaG’s car. Mainly for ease of getting to places, but partially, I think, after the longish wander down to the bar last night, we were just feeling lazy. First stop: Voodoo Donut. It’s probably a good thing I don’t live in this town, as Voodoo Donut would be a regular stop. We didn’t have anything special (although I tried my best to get JaG to have a C&B (check the menu, you’ll figure it out), mainly because I thought the resulting photo would be priceless (or good for a little light-hearted blackmail, at the very least)). I had the Portland Creme, the Dirt, and something else that I don’t remember the name of it. As we sat on the bench outside, eating donuts and sipping tea, we watched the runners from Race for the Cure wander past, the finish line being only a couple of blocks away. And quite a few of them managed to find their way to Voodoo Donut, believe me. After wandering around a bit (to let the donuts and tea settle), and commenting that the “encouraging” guys on the Race for the Cure truck (you know, the guys at the end of the race saying annoyingly positive, “you’re almost there” stuff through loud microphones) had the worst jobs in the world, we headed off, out of downtown. It is at this point that I should say that one should never, never attempt to navigate a foreign city whilst trying to listen to a comedy CD. Namely a comedy CD by The Lovemaster, Craig Shoemaker. I can’t tell you how many times to day we nearly headed off down the wrong freeway because we were laughing so hard. 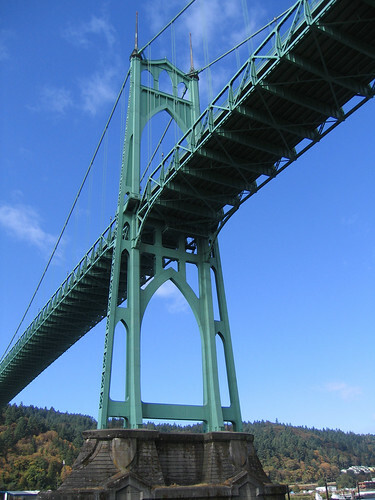 A quick jaunt north, between the river and Forest Park, and across the gorgeous St. Johns Bridge brought us to our destination: Cathedral Park and the Portland Pirate Festival. Plus lots of booths all selling all the pirate goodies you can imagine, and all to benefit a good cause. 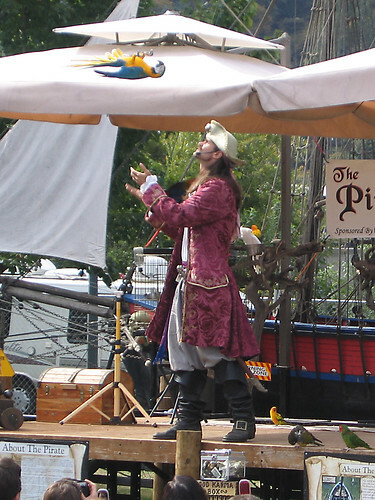 Believe me when I tell you: Portlanders take their pirates seriously. Some of the costumes we saw were exquisitely detailed, and looked dammed expensive to boot. 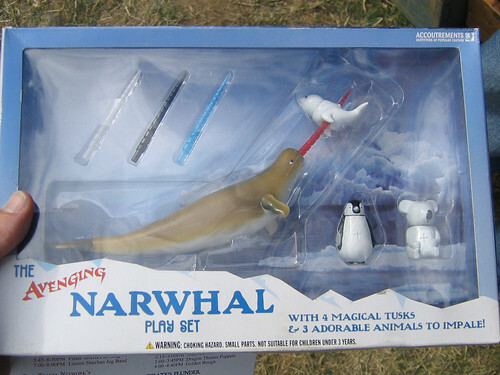 Now who wouldn’t want a toy with “animals to impale”? 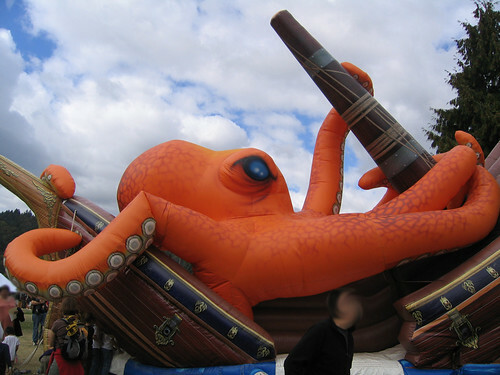 It’s perfect for the kiddies! JaG and I giggled for some time over this one. Yeah, we’re twisted. I very nearly bought one, but put it back as I’m trying to be at least a little bit fiscally conservative on this trip. But if you want one, you can get it here. After wandering around and perusing the goods, partaking of lunch, and heading out snacking on a waffle cone from the Ben & Jerry’s stand, we headed back downtown. No, really, it was just the cone. Really. Why doesn’t anyone believe me? Working our way back across the St. Johns Bridge, we turned right and angled left into Forest Park (more info here and here), a massive park on a hillside to the north and west of the city. Admittedly, LA has the large Griffith Park, one of the largest urban parks in the US. But as I pored over a map of Portland, I couldn’t help but notice how many little and medium-sized parks there were, all over town. The City of Los Angeles is notably park-poor. This may not have made a difference when everyone had a backyard, but as LA transitions to higher-density housing, that lack of parkland is a real shame. Anyway, there it was, and we were driving through it, a huge green swath in the middle of the city. You can even hike 30.16 miles through it from end to end on the Wildwood Trail. NW Skyline Blvd, along the parks west side a few houses with horse pastures no less, a mere 10 minute drive or so from downtown. Between that and the river, nothing but parkland. We stopped at the Portland Audubon Society center, picked up a park map, and stepped out for a quick hike through their grove of trees. Pretty all around. Back at the center, we visited some of their injured raptors, such as Hazel the Spotted Owl. 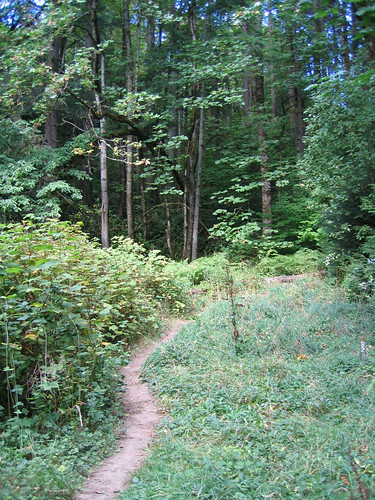 Walking along the trail at the Portland Audubon Society. Jumping back in the car, we returned to the city (the long 10 minute drive) and headed to REI so I could get a camp chair having, of course, managed to leave mine at home. A bit more debating about directions, a brief jaunt the wrong way down a streetcar-only street (again, don’t listen to comedy CD’s in a foreign town, trust me) and we were headed back over the river to the Hawthorne District. There we stopped at, got a couple of slices of pizza and a couple of drinks and watched “Sicko”. The Baghdad Theater is an amazingly simple, good concept that I can’t believe hasn’t shown up in other cities. The concept is this: rip out every other row of seats, install tables in their place, serve food and drinks (including alcohol) during the movies. Brilliant. The theater itself is a fine example of theater that are by and large now gone. Balconies, fancy artwork; the type of theater from when going out to the movies was an experience. Sicko was fun to watch with a Canuk. We both admitted that the ways in which our medical plans were portrayed was simplistic (Canada’s isn’t as perfect as Moore would have you believe, nor is America’s quite as horrid). Still, she thanked her lucky stars to be in a system when everyone was guaranteed coverage, and I’ll admit to being just a little jealous of that. All is, of course, is why it’s proving to be such fun to have JaG along on this trip: she adds her own point of view and it makes for some fun discussions. After the movie we wandered the shops of Hawthorne District (JaG needed to drool over shoes), got coffee, and spent an hour or so in the Hawthorne branch of Powell’s Books (a good warm-up for tomorrow). « Oregon Trip Day 4: Back into the city: Portland! Well, the dark beer was pretty thick… Heh. Well it’s slightly better now…. The Avenging Narwhal is hilarious! I want one! i saw voodoo donut on some food tv or travel channel show – mmmm bacon donuts! what an all around hilarious day you had, GH! nice!! I may have to thieve the narwhal thingy. I forgot about the hilariousness of it. 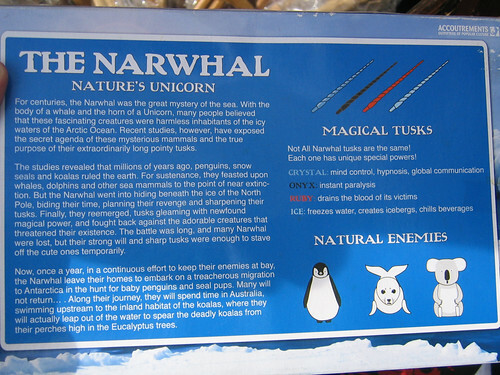 Re the narwhal toy…its just mean to say ‘three adorable animals to impale’…poor koalas. Why would koalas and penguins all be in one place? Baffling. Voodoo donuts seems interesting…I wonder who does get married there.